Award winning chef Sergio Cinotti has set his sights on winning a gold medal with Culinary Team Wales at the Villeroy & Boch Culinary World Cup in Luxembourg, which begins on Saturday. 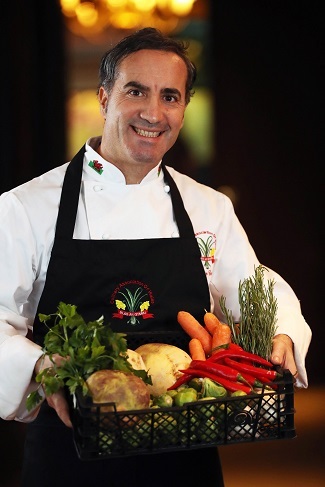 It will be Sergio’s first major international culinary competition with the Welsh team and he can’t wait to put his cooking skills to the test against the best in the world. Co-owner of Gemelli and Gem42 restaurants in Newport with his twin brother Pasquale, he said: “It means a lot to me to be accepted as a member of the team and it’s a fantastic experience. “For someone who is passionate about food, it is the ultimate goal to represent your country and be part of the team. Last night, I cooked in my restaurant and two customers waited for me to come out of the kitchen to wish me luck which was fantastic. Originally from Rome, Sergio has lived in Wales for 26 years and met his wife while studying English at Cardiff University. Having won awards for his cooking at school, he trained at Michelin star restaurants across Europe, including the famous El Bulli, Catalonia, Spain. He then came to Wales to study and opened Gemelli patisserie in Newport with Pasquale to supply quality desserts to hotels and restaurants. In 2014, he decided to resume his career as a professional chef and converted the patisserie into a restaurant with great success. Gemelli was voted Best Italian establishment in Wales at the Welsh Hospitality Awards in 2015, Best Restaurant in Wales at the Welsh Food Awards in 2016 and Best Italian restaurant in Wales last year as well as being awarded two AA rosettes for culinary excellence. This year saw the restaurant winning Healthy Dish of the Year and Best Italian Restaurant in Wales at the Welsh Hospitality Awards as well as Best Italian Chef in Wales. In August this year, Sergio and Pasquale opened Gem 42 focusing on dishes using the very best seasonal Welsh ingredients and the restaurant quickly achieved two rosettes from the AA. He has noticed a marked improvement in Welsh restaurants in recent years, saying that the public is now much more open to new ideas and modern cuisine. 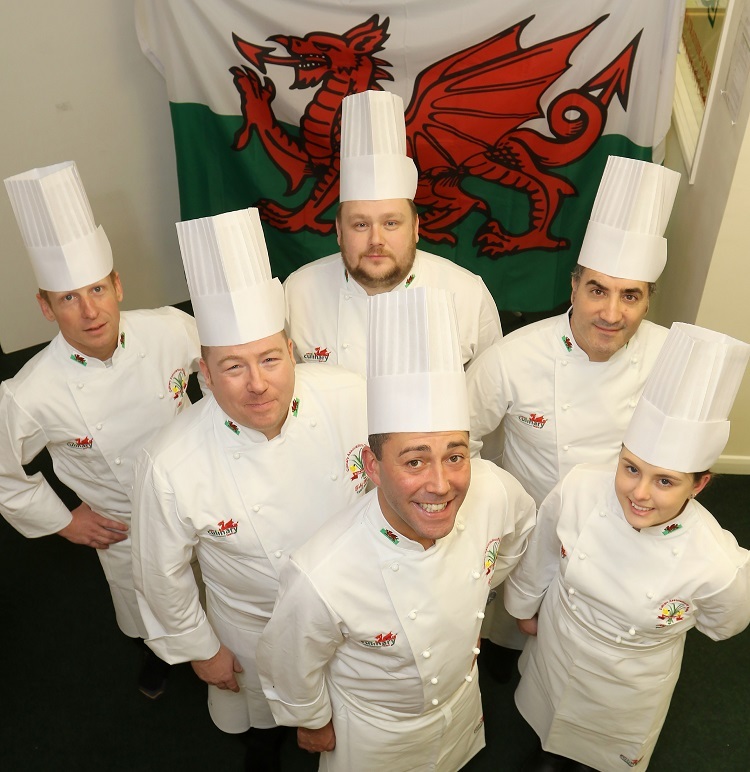 Culinary Team Wales is captained by Danny Burke, co-owner of Olive Tree Catering, Runcorn. His other teammates are Toby Beevers of PSL Purchasing Systems, who is also team manager, Jason Hughes, who is to open his own restaurant in Menai Bridge in partnership with Bocca in the new year, Alun Davies, former captain of the Combined Services and RAF culinary teams who is based in Winchester and Alys Evans, an award-winning patisserie chef from Gilfach Goch. Supporting the team are chefs Mark Robertson from Coleg Cambria, Deeside, Matthew Smith from Lake Vyrnwy Hotel, Llanwddyn, drivers Gareth Dwyer and Chris Simga and Grwp Llandrillo Menai students Oliver Parry-Molloy, Morgan Read and Dalton Weir. The hot kitchen menu comprises a starter of scallops, ceviche, compressed cucumber, Café de Paris, chicken skin granola seawater and sea herbs. Main course is hay-smoked loin of Welsh Lamb, lamb tagine, almond puree, pearl couscous and apricots. Dessert is white chocolate and lemon mousse with Welsh honey, raspberries, raspberry sorbet and mint.